Maybe I’m stating the obvious to some, but I titled this post with words I need to remember often. When there are loads of decisions to make and far too many things to fill the calendar with, I either get overwhelmed and stop doing altogether or take it all on and eventually wear myself out. What I thought would get done in the last few months didn’t get done. 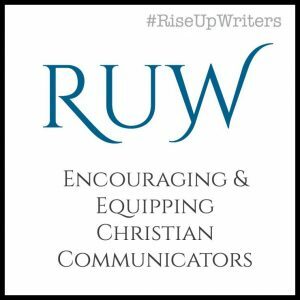 What I thought was most important, at least for writing related work, didn’t get attended to and that’s a hard reality to swallow for this driven-gal. It’s not just the desire to create that motivates me, but knowing this content could be helpful to others. It’s the love I have for the work I do and the people I serve. I said yes to other things which meant saying no to writing things. Will I choose to accept the OK-ness of my limitedness? 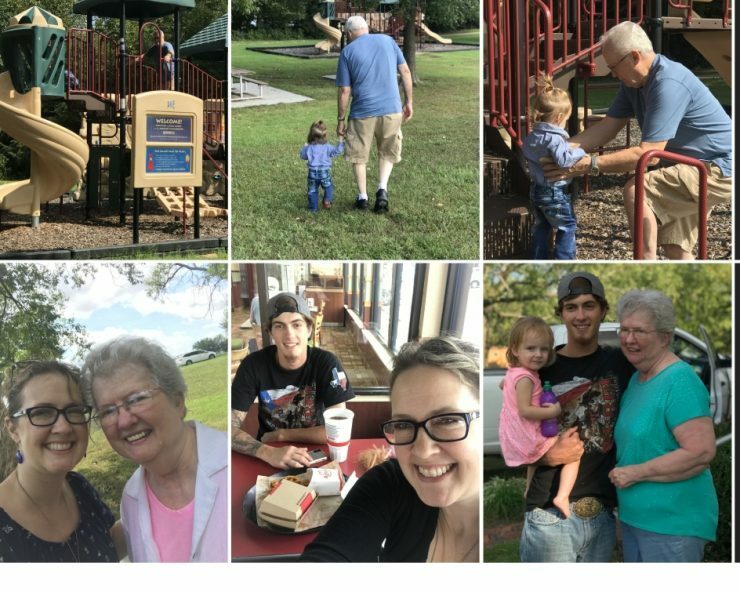 In September, my 21-year-old son took my granddaughter to meet my parents in Kansas. I went with him. It took me away from writing work for a few days but gave the gift of precious time with loved ones. We visited the park where dad’s volunteer efforts paid off. After years of fundraising, one small community got a new playground and a half-mile walking trail. My sweet granddaughter climbed that playground with her dad and great-granddad while happy tears filled my eyes. In November, we traveled to MN for our first Thanksgiving there since I moved away over twenty years ago. I laughed with my sister, watched cousins play, enjoyed the frozen falls of Minnehaha, and Daddy D got to see his brother too. That’s a whole ‘other story for another day, and it’s not my story to tell. It’s a pretty amazing God-thing, y’all. By December, I was all things Christmas and focused on family. Our five kids, my soon-to-be daughter-in-law, and my granddaughter came under one roof. As our kids get older, opportunities for the lot of us to get together are few. I went into overdrive with all the plans so it felt crazy during the weeks leading up to it, but I don’t regret it. I chose high activity to foster memories that last. In the midst of this busyness, I intentionally said yes to projects, like helping our 15 year old son purge his room and paint it and selling vintage store catalogs to raise money for Christmas presents. 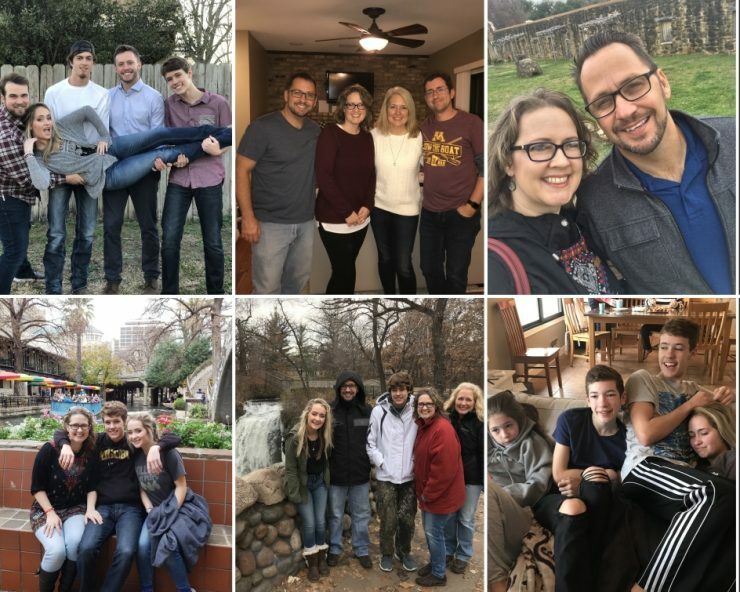 I also said yes to days with lots of margin so I could soak up time with God and we could plan family outings especially during my step-son’s visit from CA. Intentionally saying yes to these activities meant indirectly saying no to other things, like blog posts, new videos, sending out newsletters, and planned social media content. I wanted good things, like staying consistent with writing and creating new content. I chose other good things. I don’t need to do it all. He holds it all together and only asks me to do my part. Sometimes, my part isn’t as big as I think it is. Sometimes, it’s more. My kids and Daddy D remind me of this too. One son said I should sit back, relax, and listen to Buble’ throughout December. But let’s face it, this child isn’t as inclined to plan ahead as I am. It’s not easy to know when to stop and when to keep going. Is it? Or maybe that’s not an issue for you like it is for me. Ever feel the pressure to do more, finish more, do it all? Maybe you mentally know you can’t do it all, but something drives you internally to feel like you should. You think you have to, because if someone doesn’t, who will. It’s rationalization and most of us are all too familiar with it. Too many plans and the planner gets worn, frustrated, grumpy, and ready to sleep instead of play. We need to choose what to say yes or no to. When we do this intentionally, we experience greater peace about not doing the thing we once felt compelled to do. 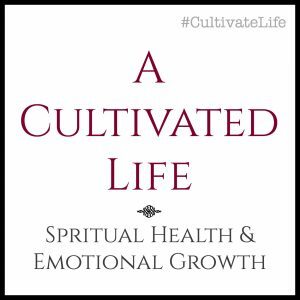 When I apply this principle, my spirit’s not completely assuaged, but slowly, this process helps relieve built-up anxiety from the belief that I have to do. I can do what I can do, but I can’t do it all. I don’t need to do it all either. I tend to take on too much responsibility. This is the way of many who wrestle with codependency and people pleasing. Of those who struggle to rest in not doing, or accepting their own limitations, or setting boundaries for self and soul. Whether it’s the holidays, vacation planning, or day-in and day-out living with the people in our circles, we have choices to make about what we can do and what we can’t. We have to let some things go in order to do other things. Saying yes to one person or activity means indirectly saying no to others. Where will we say no? Will we make space for other yeses, or will we let our yeses choose our nos for us? Maybe all this doing is because we’re doing more than our part. If we’ve done for others what they can do for themselves, we’re enabling them and disabling ourselves. We’re saying yes to them when we need to say yes somewhere else. Remember, we can’t say yes without also saying no, even if it’s unintentional or unknown. When we stop doing what we’ve done, some may have to face decisions that aren’t easy but help them grow. Not doing for others what they can do for themselves, especially when this is a common way of operating and the pattern of a relationship, provides a perspective shift for ourselves and others. We might realize we’ve been doing things we don’t actually need to do. Maybe it’s because it’s not up to us to do. Maybe it’s not our season. Maybe we’re meant to say yes to other things. It could also be that our people pleasing meter gives a false reading, telling us that all this doing is helping others, but it’s not. And it’s weighing us down so we don’t do the things we’re called to do. When we do things because we feel duty bound, there’s a good chance we’re doing them for unhealthy reasons. The duty we feel is self-imposed. We can let go of unnecessary things as well as good things that seem right when we listen to the Spirit’s nudge for His right in that season. What was right for us a few months ago, may not be the right thing today. Ask Him what’s He saying now. What does He want to say today that might be different than yesterday? What we choose to let go of may be resentment for carrying responsibility that was never ours to carry in the first place. If you chose to sacrifice something you wanted to do in order to do something for others, remember this was your choice. Not theirs. You took on that responsibility. It’s a hard thing to swallow, but accepting this truth will free you to choose yeses and nos with purpose in the future. Resentment builds towards another person when we say yes to others without recognizing the no we simultaneously say to ourselves. It builds even more when they don’t do what we think they should simply because we said yes. Those hard to let go of things, the ones we feel compelled to do and have done for years, may be the very things we need to NOT do. Maybe for a season. Maybe not at all. When we can’t do it, we can be OK. We need to remember it’s not up to us to make it all OK for ourselves and everyone else. Because we can’t do it all, ww’re reminded how much we need the One who has it all under His care. When we don’t do it all, we’re reliant on the One who cares more for us, or anyone else, than we ever could. 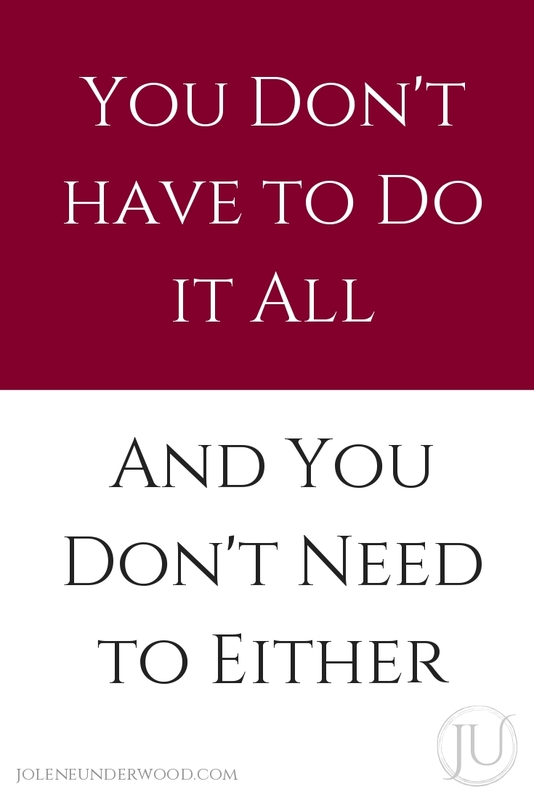 We don’t need to do it all and we don’t have to either. 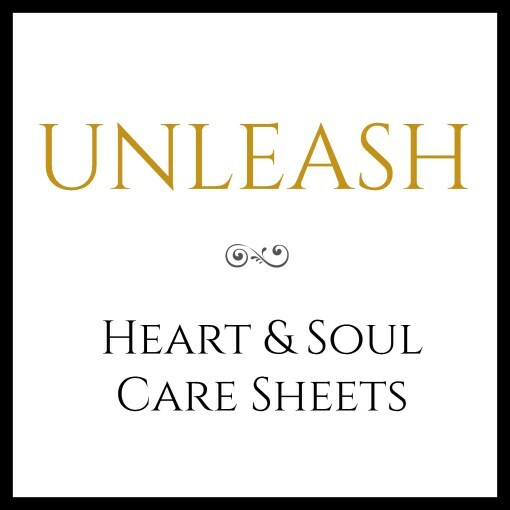 Unleash: Heart & Soul Care Sheets can help you work through the thoughts and feelings you have around what you’re doing or not doing. 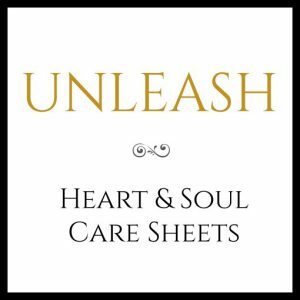 By using these regularly you might notice themes that identify unhealthy beliefs or unhealed hurts. You’ll also be spending time asking God to speak and learning to hear from Him. I have no idea what He already wants to say to you. But He does. How about making space to listen today? 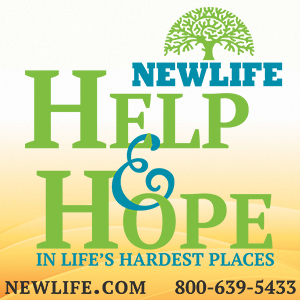 These books on boundaries cover various aspects of our lives and souls. They are helpful for identifying healthy limits and learning to live within them. Click through to the page and scroll to the section for Boundaries. Are you feeling bitter? 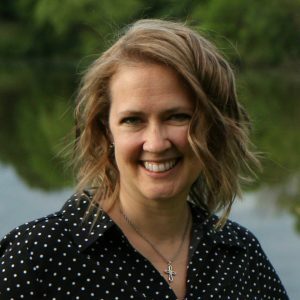 Where is your bitterness focused? Do you feel anxious and frustrated about doing something because you have to and not because you want to? Can you give and do out of the overflow of what you have or are you feeling more and more depleted? What am I saying yes to that’s unintentionally saying no to other things? Am I OK with saying no to these things?